"New! 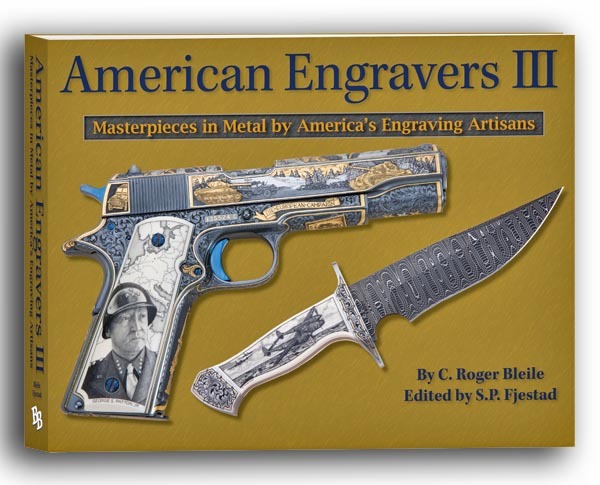 American Engravers III - Masterpieces in Metal by America’s Engraving Artisans by C. Roger Bleile and edited/published by S.P. Fjestad. • Large 9x12 in. landscape format with 264 pages and unique double fold-out! • More than 50 pages of Colt guns alone! Destined to be a classic, American Engravers III once again sets a new standard for art and engraving publications. C. Roger Bleile and Blue Book Publications have created another classic book on engraving that all involved can be extremely proud to be a part of. I love Roger’s writing because he skillfully includes just enough ‘engraver’s speak’ to be accurate, yet not so much that the reader is confused. I think Roger ‘writes from the bench,’ which is why these books are so good. Simply a must-have book for anyone who enjoys the art of engraving. – Leonard Francolini, Master Engraver"